Ross Jones speaks with Wayne County Executive Warren Evans. 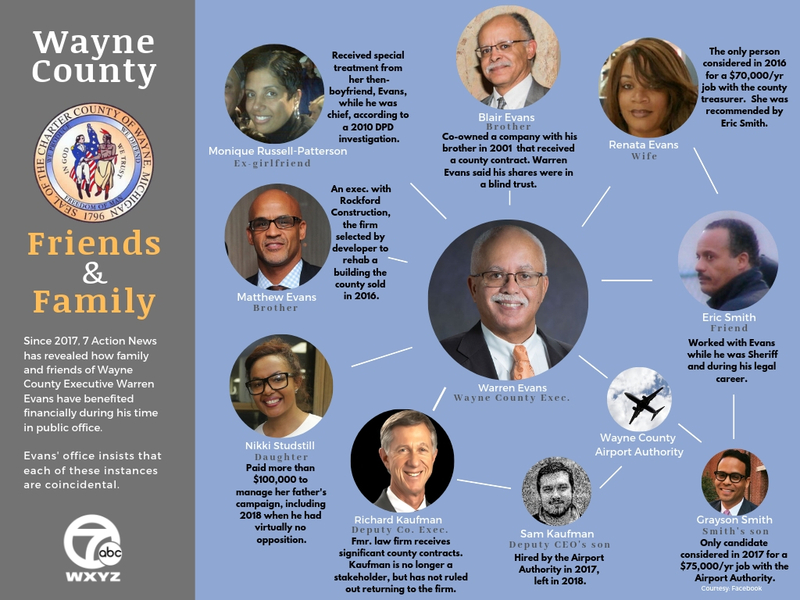 Two hires at the Wayne County Airport Authority with close ties to Wayne County Executive Warren Evans’ office are raising questions about favoritism inside the county. In 2017, the son of Wayne County Deputy Executive Richard Kaufman and the son of a close friend of Warren Evans were hired at the Airport Authority. Both hires included unusual circumstances, according to sources close to the hiring process and records reviewed by 7 Action News. Sam Kaufman, the son of Deputy CEO Richard Kaufman, began working for the Airport Authority in May 2017, according to his LinkedIn profile, first through a contracting company. Months later, he transferred from contractor to airport employee as a senior system engineer. An Airport Authority spokeswoman said he was one of two candidates considered for the position. The County Executive’s office did not respond to a request for comment. In December, reporter Ross Jones asked Evans about the hire at a public event in Detroit. “Is it just a coincidence that the son of the deputy county executive gets a job at the airport?” asked Jones. As an Airport Authority employee, the 31-year-old Kaufman was paid a salary of $85,000 salary and received full benefits. But his salary raised eyebrows with the union that represented him, which found it to be on the high-end of the salary scale and more than employees with the same job classification. As a result, AFSCME Local 1690 filed a grievance saying that if Kaufman was going to be paid that much, those with the same job title needed to have their salaries raised, too. 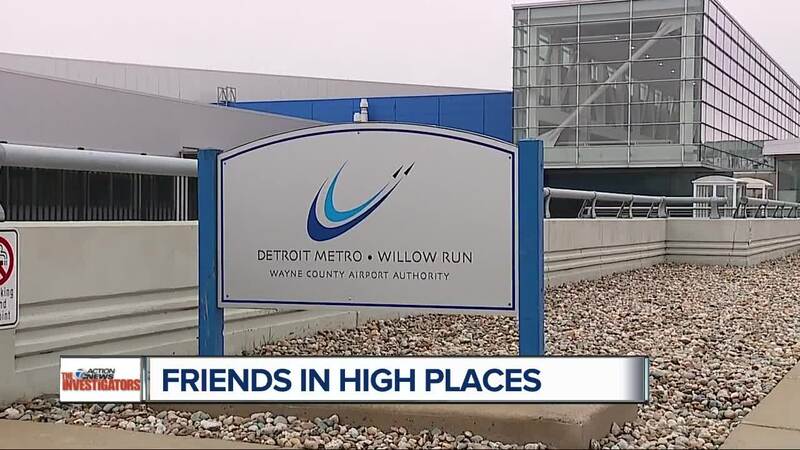 In an e-mail, Sam Kaufman told WXYZ that his father played no role in his receiving a position at the Airport Authority and that he was unaware that he applied for the position. "I got this job through an employment firm who sought me out when I was working at Quicken Loans," Kaufman said, adding that he took a $10,000 pay cut when he became an airport employee. Evans said he was aware of the grievance, but wouldn’t comment further. The grievance is set to be heard by an arbitrator later this year. Kaufman left his job with the Airport Authority in April 2018. Months after Kaufman was hired in 2017, so was 25-year-old Grayson Smith. The airport created a position for Smith as an associate project manager, paying $75,000 a year. Sources inside the Airport Authority said Smith’s hiring didn’t follow typical hiring practices. For example, Smith didn’t go through the typical phone screening, nor was there an interview panel. In fact, Smith—who only graduated from law school months earlier—was the only candidate considered for the position. Smith’s father, Eric, is one of Warren Evans’ good friends. The two worked together at the Sheriff’s office, then later doing probate work. Smith’s wife is a Wayne County Circuit Court judge. In fact, when Warren Evans’ wife got a job with the Wayne County Treasurer back in 2016, it was Eric Smith who went to bat for her, sending her resume to the treasurer who hired her a month later. Evans insisted he played no role in Smith’s hiring. In an e-mail to 7 Action News, Smith wrote: "I thank God that I have been in a position at points in my life to help friends, family and others." The Wayne County Airport Authority was created in 2002 after the airport was plagued by questions of favoritism involving family members and friends of county power brokers. The Airport Authority was intended to lessen the influence of the Wayne County Executive and Commission. Today, four of the seven seats on the Authority board are appointed by the County Executive. One is appointed by the commission. News of the two hires at the airport drew the ire of Wayne County employees. “It’s still the friends and family plan,” said Susan Thompson, president of AFSME Local 25. Thompson represents about 60 county employees. While the airport created a position for Grayson Smith, Thompson says it’s been a different story at the county, where many vacant positions have yet to be filled. In a statement, the Airport Authority said it “followed all established hiring practices and procedures” for both hires. Evans insists Kaufman and Smith's hirings had nothing to do with him. “I don’t run the airport,” Evans said. “There’s a lot of people, sir, who say that you do,” Jones responded.